Almost a century of combined experience in the recreational and commercial vehicle industry, along with aviation and automotive technology, led to the development of a 12-volt, high performance air exchange system for recreational and commercial vehicles. The core of the system is a powerful 12", 10-blade rotary fan that works with a slightly open window to create a balanced airflow. It is designed for maximum air exchange, minimum sound levels and power consumption. Fresh, clean, natural air is pulled in. Hot, stale, stuffy air is pushed out. Fan-Tastic Vent will exchange the air in your vehicle in minutes. Cooking smoke and unpleasant aromas are whisked away in seconds. Fan-Tastic Vent can reduce the use of air conditioning allowing you to breath natural, fresh ambient outside air. Fan-Tastic Vent is light weight, compact, bug resistant, durable and seals tight when not in use. The sealed motor operates at variable or 3-speeds depending on the model for selected performance levels. Installs in minutes and fits the standard existing opening provided by most recreational vehicle manufacturers. Whether your rig costs $5,000 or a million dollars, the quality of the air you breathe should remain your paramount objective. Plug in Endless Breeze and the large volume of air movement will surprise and delight you! Three fan blade speeds (low, medium, high), and a manual dome lifting knob. Model 8000 C-A-B by Fan-Tastic Vent is an entry level best-in-class fan that is great for bathrooms or any 14" x 14" opening in your RV. 1 year limited warranty (all parts). Three fan blade speeds (low, medium, high), a reverse switch sets the fan blade direction (OUT-exhaust or IN-intake) and a manual dome lifting knob. Model 4000R moves the same volume of air as fans with more options. It's simple yet effective. Three fan blade speeds (low, medium, high), a reverse switch sets the fan blade direction (OUT-exhaust or IN-intake), a manual dome lifting knob and a built-in thermostat. Set the thermostat to your desired comfort level and let the fan do the work. Model 5000RBT is designed to maintain a consistent temperature setting. It's perfect for use at bedtime or whenever you leave pets behind. 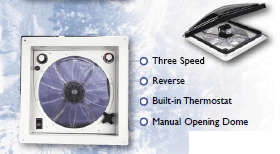 Three fan blade speeds (low, medium, high), a reverse switch sets fan blade direction (OUT-exhaust or IN-intake), a builtin thermostat, automatic dome open/close switch and a rain sensor. Model 6000RBTA automatically opens and closes your dome at a flip of a switch. A built-in thermostat maintains your desired comfort level. 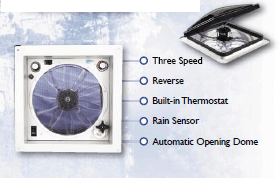 When the rain sensor becomes wet the dome automatically closes and reopens once sensor dries. The built-in manual knob allows for closing the dome in a emergency. Automation at its finest. 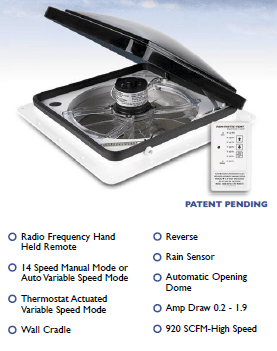 This patent pending model fan has 14 fixed manual speeds or automatic variable speeds with a reverse switch that sets fan blade direction (OUT-exhaust or IN-intake), a rain sensor with On/Off switch, an auto dome opener via mode selection and a radio frequency hand held remote with wall cradle for traveling or fixed wall operation. Raise the dome and activate the fan from your "easy" chair. Our radio frequency handheld remote has you activating the fan and raising the dome by pressing the mode pad. With the automatic speed mode, you select your comfort setting and the blades will automatically turn on, off, increase or decrease speed to maintain your temperature choice. The manual speed mode allows you to select off or one of 14 fan blade speeds. Our custom wall cradle is made for your convenience. Select an easily accessible location, install the lightweight cradle and operate your fan from cradled remote or remove and operate the fan from anywhere inside or outside your coach. From ease of installation to ease of operation, the 6600R/417 is the ultimate Fan-Tastic Vent. Installing a fantastic RV vent on the roof of your RV is a pretty simple job when replacing an existing vent with 12 volt wiring nearby. First, you will need to remove the inside vent garnish. This is normally fastened to the ceiling with 4 screws. Remove the screws and remove the garnish. Next, you will need to disconnect any wiring to the existing vent if it has a fan in it already. Now you will have to get up on the roof and scrape the caulk away from the screws that are around the perimeter of the vent flange. Once the screws are removed, carefully insert a putty knife in between the vent flange and the roof material and gently pry up on the vent. While prying the vent, be careful not to pull to hard on the vent as you risk tearing the roof material. Once the vent is removed clean the existing caulk and putty or butyl tape material from around the perimeter of the 14 x 14 opening in the roof. Once the area is cleaned you are ready to install your Fantastic vent. You will need to apply new putty or butyl tape around the flange of the vent then insert the vent into the center of the opening in the roof. Next, fasten it to the roof by installing screws into the existing holes in the Fantastic Vent. Once the vent has been fastened to the roof, caulk all screw heads and around the perimeter of the vent with rubber roof caulk (for rubber roofs) or latex caulk for others. Now its time to finish the interior. If the previous vent was wired, simply use the existing 2 wires and connect them to the new Fantastic vent. If not, you will have to find a 12 volt DC source. In most cases, there is usually a ceiling light nearby that you can tap into making sure that the light is not operated by a wall switch. Remember to not reverse the polarity. If you have one red and one white wire, red will be positive (+) and white will be negative (-). If you have one black and one white wire, black will be positive (+) and white will be negative (-). If you have one red and one black wire, red will be positive (+) and black will be negative (-). You can connect these to the corresponding wires on your new vent. Once that is connected it is time to install the garnish by raising to the ceiling and fastening it with the 4 screws previously removed from the old vent. That's it your done and can sit back and enjoy the fantastic air circulation your new vent provides! Copyright © 2009 Fantastic Vent.NET. All rights reserved.